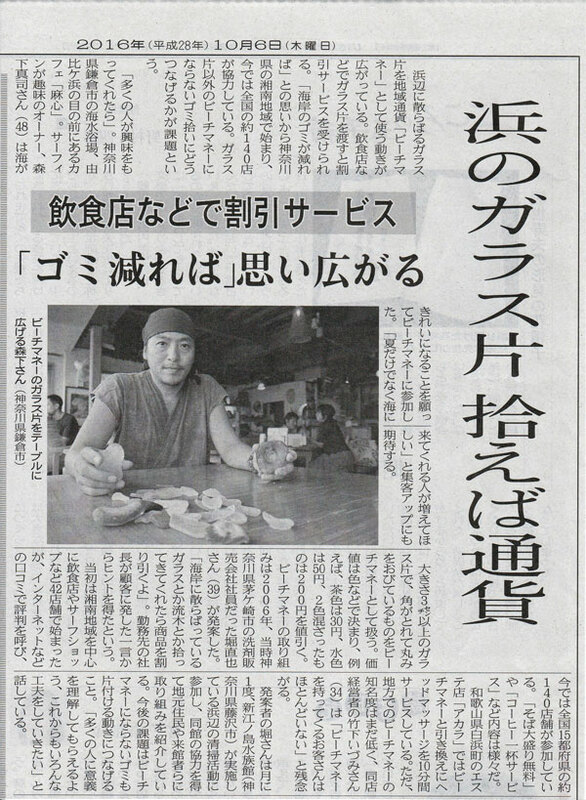 Nihon Keizai Shinbun (Japanese Newspaper) on this Thursday, Oct 6th had a story about Beach Money. The guy in the picture of the article is Shinji Morishita, the owner of Magokoro café in Kamakura, which is one of the original Beach Money shops. The article said that the next step for Beach Money would be that those people who pick up beach glass actually pick up trash on the beach. Part of our goal is to get more people to the beach so that they can realize how much trash is left there. You may find beach glass on the beach but also full of marine debris and garbage such as cigarette filter, plastic bags and pet bottles. Most of the garbage do not degrade in the water. You can pick up one trash at a time, no need to be a lot. I am talking a story like this more often at my environmental workshop at local schools. We have currently 143 Beach Money shops all around the country and we work closely together toward the same goal, which is keeping our beaches clean. The shop owners talk about Beach Money in the conversation with their customers and at the same time offer a little discount. Shop customers can help our activity by supporting Beach Money and also purchasing “All Things in Nature” laundry detergent (Part of the sales goes to Beach Money). It is part of my responsibility to talk about what Beach Money is doing through the printed matter, event and the environmental workshops. We appreciate.